Airbrushing is a technique of creating art by mixing air and paint to create a fine mist which is applied to a variety of surfaces such as metal, paper, etc. 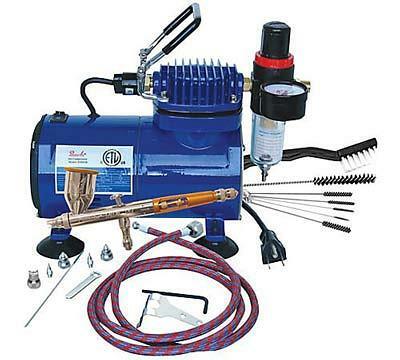 A compressor is used to push an even rush of air through a hose to the brush for uninterrupted spraying. Compressed air cans perform the same function, but only for a short period of time before they need replacing. Creating cartoon graphics, t-shirt illustrations, arts and craft projects, car/motorcycle graphics, and more can be created by using the right airbrush. 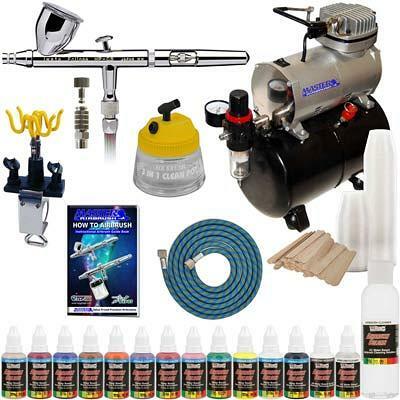 As a budding airbrush artist, you may be wondering if your budget can handle the expense. Just how much is an airbrush kit? They run in the range of $90 – $300 depending on what’s included. If you don’t know where to buy an airbrush, relax. We’ll point you in the right direction to find the best airbrush kit for beginners. If you’re interested in learning how to airbrush, try this airbrushing kit for beginners. It’s a complete kit to get you started asap. •Model G22 has a dual-action airbrush, one 1/3 ounce gravity fluid cup, and a 0.3mm needle and nozzle that can spray hairline-fine lines up to 1.5 inch wide patterns. •Model S68 has a dual-action siphon-feed brush, a 3/4 ounce fluid bottle, a 1/6 ounce color cup, and a 0.35 mm needle and nozzle that create thin lines up to a two-inch-wide pattern. •Model E91 has a single-action external-mix siphon-feed airbrush with a 0.8mm tip, and two 3/4 ounce siphon bottles with a 1/8 inch air inlet. This model can be used with either a compressor or a propellant can (hose and adaptor included). 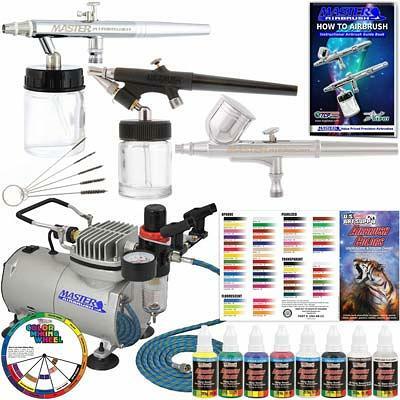 Included with each model are a four-inch color mixing wheel, a six-foot braided air hose with 1/8 inch fittings, compressor-mounted cup that holds two airbrushes, a five-piece mini-cleaning kit, thinning reducer, and a bonus booklet “How-To-Airbrush” manual. Six one-ounce bottles of primary paint are also included: opaque deep black, opaque white, opaque bright yellow, opaque grass green, opaque safire blue, and opaque bright red. The master airbrush compressor can be a bit loud, but for the price it’s a great airbrushing kit for beginners. While it doesn’t produce fine lines exceptionally well, it’s great for projects that require thicker lines. Enjoy this kit that can be used to create fine lines while the special fan air cap accommodates a wider coverage area measuring up to three inches in diameter with a three-spray head. Tips and tricks are outlined in the instructional DVD, and cleanup is super easy with the included cleaning kit. 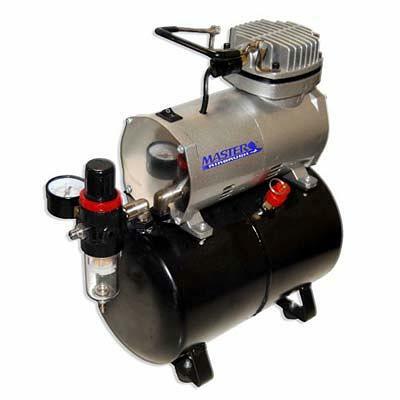 The compressor runs quietly as it delivers 20–40 PSI which is dependent upon the head being used. Since the included hose is designed to thread into the airbrush via a grip nut, swapping out the brushes is a no-brainer. Meant to provide a solid foundation of basics techniques, this kit guides you from beginning to end on the art of airbrushing. Not only is an instructional DVD included, but you also get access to download five extra educational guides to help hone your skills. The compressor is compact for easy portability as it delivers consistent air pressure to achieve even results. It runs quietly, but it can get warm if it runs for too long. A short cool down break may be needed for larger projects. Rest the brush in the top-mounted holder of the compressor until you’re ready to start again. 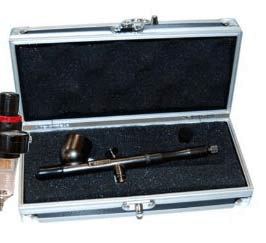 Ready to go straight out of the box, this kit has it all: a gravity-feed airbrush, a fine 0.21mm needle/nozzle with a 1/3 ounce cup, tankless air compressor with regulator, gauge, filter, and 1/8 inch air hose adapter that fits Iwata hoses. It’s also oil-free and comes with a full two-year warranty (compressor only). Paints are sold separately. The carrying case adds a professional look while maintaining the lightweight compact design. The ultra-fine spray provides extensive control for making fine lines exactly where you want them. With possibly the best air compressor for airbrushing in this review, it has 1/5 horsepower to push a strong, clean, and precise airflow. If it becomes overheated, the automatic shutoff feature turns it off. It’s set to automatically turn on when it hits 30 PSI, and automatically shuts down when it reaches 60 PSI. With the air-on-demand feature, it works when you need it and turns off automatically when not in use. 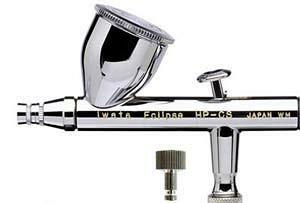 The Iwata airbrush kits with compressors will get you off and running in no time. The kit is ready to use and includes everything to begin airbrushing immediately. It contains: dual-action gravity-feed airbrush that has a 0.35mm needle and nozzle combination (great for extensive detail work), one 1/3 oz. funnel-shaped gravity fluid cup, one six-inch braided hose, one air compressor (complete with tank), one air regulator with gauge, one water trap filter, and a spray paint art starter kit including 12 paint colors by US Art Supply. The compressor has an automatic on/off setting. With the hose connection, there’s roughly 8-10 feet of reach which is a nice amount of work space. It sprays premixed and heavier paints without compromising the ease of creating those fine lines and details. The high paint flow capacity means that it can handle evenly spraying larger areas just as easily as it does smaller ones. There is a “quick connect” for easily detach the airbrush from the hose. 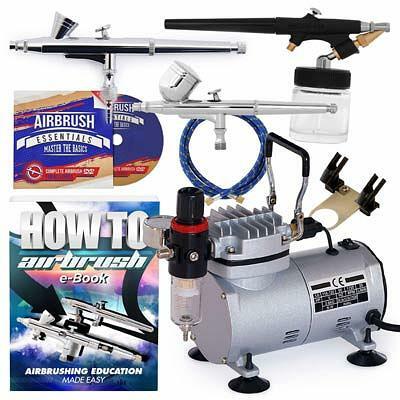 Read the “How to Airbrush” manual and watch the included instructional video first to establish some basic knowledge before using the kit. It provides excellent pointers on different types of paints and how to use them, various spray patterns, and how to spray different types of surfaces. When your project is done, take care of the mess by using the 3-in-1 cleaning pot and solution that consists of 100 one-ounce plastic mixing cups, 100 mixing sticks, and an airbrush cup that’s big enough to hold up to four brushes. All in all a great starter package for the artistic airbrushed! Starting out can be expensive, so buying a kit that contains all the necessities is easier than figuring out where to buy an airbrush and its accessories separately. Perhaps the better beginner kits are the Iwata Airbrush Kits with Compressors. 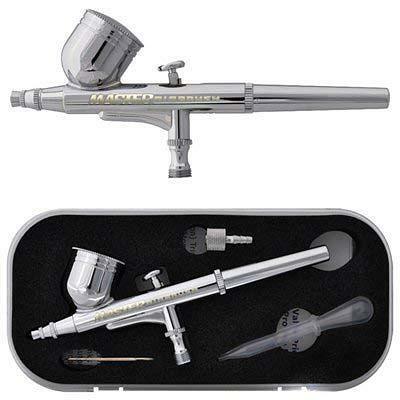 It has the most supplies, paints, accessories and includes a Master compressor for airbrushing. It’s more expensive, but if you’re serious about airbrushing, buy the entire kit once rather than work your way up. If that’s not an option, the PointZero Airbrush Kit is less than $100 but has enough supplies to get you acquainted with airbrushing without breaking the bank. 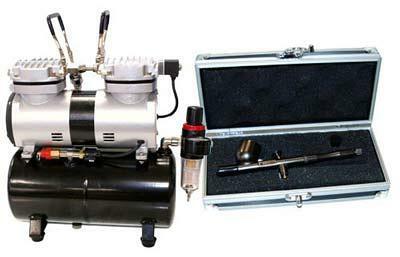 If you are looking for a beginner airbrush kit with compressor and on a low budget this might be just right for you.